Photo from a site providing Yamanashi information, ‘Yamanashi-no-Now’. One of the distinctive feature of ‘Jukai‘ around the foot of Mt. Fuji are caves and lava tree mold caves formed by the running lava by the eruption of Mt. Fuji. There are many off-limit-caves which interests you when you find the dark open entrance in the forest but don’t enter in them but visit caves that have been developed a bit for you to walk into safely. Entrance. Photo from ‘Yamanashi Tourism Organaization Official Site’. BBQ hut. Photo from ‘Yamanashi Tourism Organaization Official Site’. 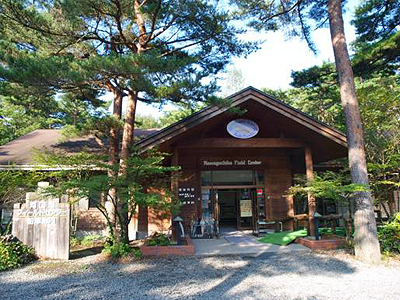 Kawaguchiko Field Center is a facility which provides you activity to enjoy the deep Jukai forest as a day-camp, craft making and forest guide (reservation required beforehand). The guides are only in Japanese so it may be better for you to enjoy the place by following the walking map that they provide and visiting the shrine, ‘Utsumuro Sengen Shrine’ adjoining the building of the center. Of course, craft making won’t be much trouble even if you don’t understand Japanese for you can work through on it by watching others. 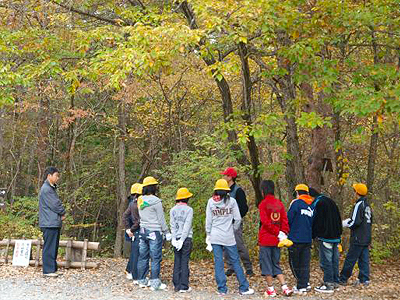 Nature tour .Photo from ‘Kawaguchiko Feild Center Official Site’. 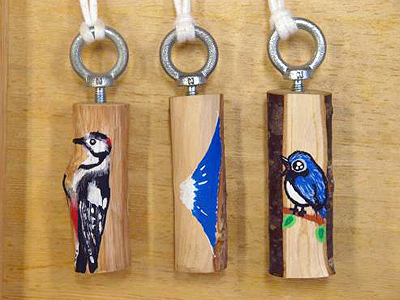 Making crafts like bird callers. 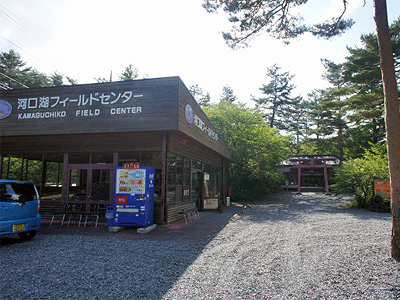 Photo from ‘Kawaguchiko Feild Center Official Site’. ‘Utsumuro Sengen Shrine’ is a shrine which was built in the beginning of 17th century when the big lava tree mold was found in the place. Utsumuro Sengen Shrine. Photo from a site providing Yamanashi information, ‘Yamanashi-no-Now’. 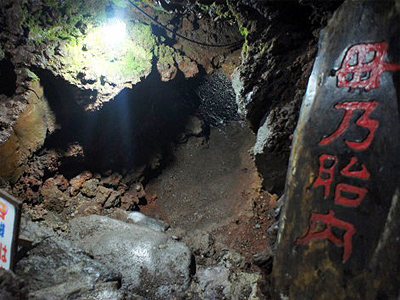 Entrance of the lava cave. Photo from a site providing Yamanashi information, ‘Yamanashi-no-Now’. Lava tree molds are formed by the eruption and the lava flowing out from the mountain. When lava flows over the trees, most of them burn out instantly but some of the big trees remains as charcoals. The tree charcoals remain under the cold lava for years, gradually dissolves leaving the shape within the cold lava. 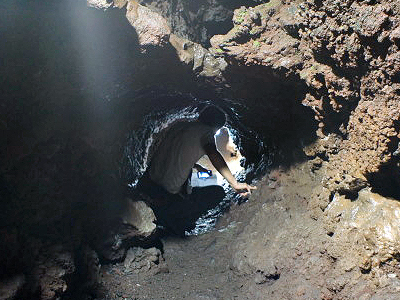 This ‘shape’ is the mold of the tree, which now we find it as one of the cave around this area. 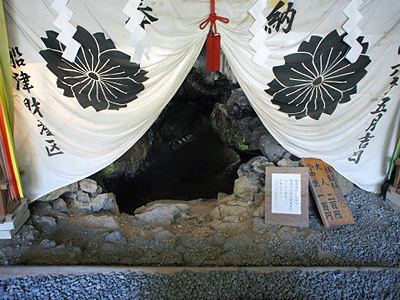 The lava tree mold lying beneath this ‘Utsumuro Sengen Shrine’ is one of the biggest lava tree mold cave where you can walk into has a name ‘Funatsu Tainai Jukei (Funatsu womb-like lava tree mold)’ which was related to the religious ceremony of reborn and purification because of it’s shape. Reborning may relate to the worship of ShugendoW, a belief that is strongly related to worshiping nature and mountain gods. They strongly searched for the ways of purifying their sinful souls and put themselves to several religious austerities. One of the way was to be reborn to lead a new life and for doing so, the ascetics regarded such caves as their mother’s wombs from their looks, went inside and came out as they were born new again. Inside the cave. Photo from a site providing Yamanashi information, ‘Yamanashi-no-Now’. Narrow passage….Photo from a site providing Yamanashi information, ‘Yamanashi-no-Now’. The lava tree mold here was worshiped by the pilgrims who climbed Mt. Fuji with religious motives. 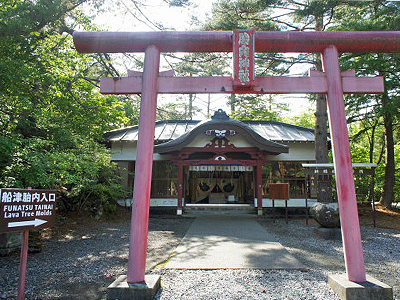 The group of pilgrims were formed in an association called ‘Fuiji-ko’ whom visited this shrine and went into the cave to purify their body and soul before climbing the sacred mountain of Fuji. Going into the cave is certainly a rare experience! Beware inside because the passage is narrow. You could be re-born again once you come out from the cave, lie the pilgrims of Mt. Fuji in the past! 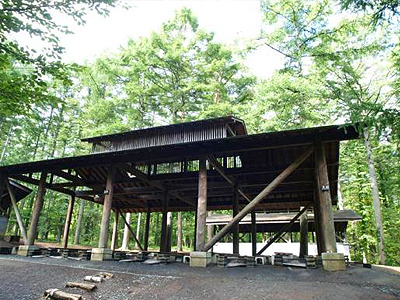 Address : 6603 Funatsu, Fuji-Kawaguchiko-machi, Minamitsuru-gun, Yamanashi Pref.